AzBaja.com, Home of the VW Baja Bug -:- Baja Forums -:- Off-Road & VW Based Clubs (4x4, ATV, Jeep, Motorcycle) -:- Events and Get Togethers World Wide -:- 3rd Annual AZBaja PlayDay at the river. Baja Forums -:- Off-Road & VW Based Clubs (4x4, ATV, Jeep, Motorcycle) -:- Events and Get Togethers World Wide -:- 3rd Annual AZBaja PlayDay at the river. 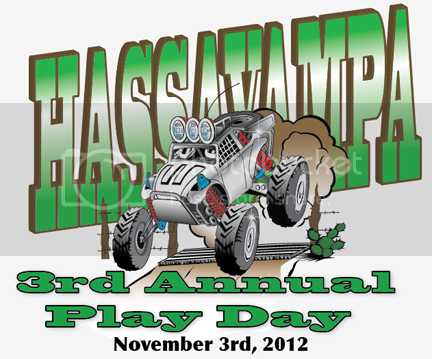 3rd Annual AZBaja PlayDay at the river. Post subject: Re: 3rd Annual AZBaja PlayDay at the river. Hey guy, I'm looking forward to come out and play, iwill be driving my jimmy. But not sure yet , just started working for swift ,not sure if ill be off. But ill try my best. Curtis @ RDC just sent me a box full of DVDs to hand out and Matt @ MAD MEDIA sent a box today full of MINT 400 swag. Get your cars ready and be ready to drive them AzBaja peeps - you are gonna compete for some really cool stuff. Post subject: 3rd Annual AZBaja PlayDay at the river. I talked to my buddy again about doin the movie out there and he's still up for it. Do you have a screen idea worked out? The feverish pace on the car had turned into a panic driven sprint so we can hopefully shake it down before the run. I'd hate to break down on a fun run. Play day is less than 1 month away. Who is gonna be there? There will be lots to do and lots of fun to be had. Look for a schedule of events to be posted in the coming weeks. Tony, can you post this on the samba for me. thinking about camping friday night. the friday night before is peoria vw's monthly cruise night, and all the west side azbaja guys meet there. if i know you're gonna be there i might head out that way...would rather not camp by myself out there though. Hey the Hassaympa is in my back yard I probally gonna head out Friday after work any way so figure where you might be camping and I'll meet you there! i plan on camping in the same basic spot as the last 2 years. when it gets closer we'll talk more about the camping situation. Just over 2 weeks away i will be bringing a truck and trailer, so if anyone has any major issues we can get you home. Does someone have a small BBQ they can bring? Dirt Junkie, with the boys and hopefully 2 bajas.